Well, a hectic fortnight of action on the table and months of planning by the NIPA has drawn to an end and we all draw breath before we move on. 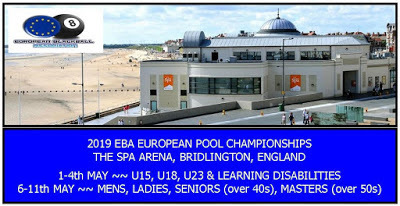 But what an unforgettable fortnight it was at the Lodge Hotel weekend and the World Championships in Bridlington. First up was the Learning Disabilities Festival, full results are to follow but our 2018 Individual Champions are Alan Bell and Valerie Taggart who both retain their crowns from the previous year. Our new 2018 Seniors and Masters Champion is Brian Crilly, a superb double from the big Bangor man. 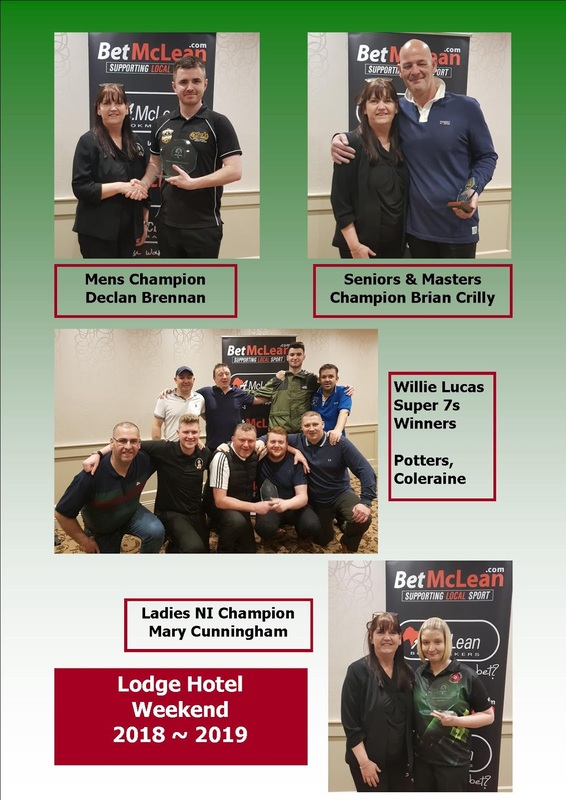 And what a competition the BET MCLEAN MENS event was. A record 134 entrants and when the final black ball of the competition was sunk it was Mayobridge's star cueist Declan Brennan who took home the winners trophy adding a new name to the list. Lurgan's Declan Duff had a fantastic run to the final and it's a good bet that in years to come the young man will put his name on it. The Willie Lucas Memorial Super 7s Event had a record entry of 21 teams and it was local team Potters managed by Remo Devito who took home the trophy. Gordon Boomer's Highwaymen were Runners Up having ousted 147 Antrim who were going for five wins on the trot. In the Plate Event long time members Crumlin won their first NIPA trophy after a few near misses in the past, defeating Newcastle in a single frame play off. A superb performance seen us top a group that included England and Wales but it wasn't to be as Derek Whiteside's lads lost in the Quarter Finals to eventual Winners France. A very tough section of 13 teams and unfortunately Michael Wilson's lads didn't make it out of the Group but had a noteable win over France and ran eventual Champions Scotland close at 12-13. Alex Irvine's lads agonizingly lost 5 out of their first 7 matches by 13-12. But they still made the Knock Out stages only to lose out to eventual winners Wales. Reached the Final and nearly retained their crown but lost to a very strong Scotland side after leading most of the match. Managers John Clarke and Sammy Henry can be proud of the lads once again. Representing Team NI in the Wheelchair event was Rab McMaw. But unfortunately it wasn't to be for the former European Champion as he lost out on Group qualification by a single point. What a performance by Declan Duff and Eamon Ferris. The pair took Gold in the Under 23 Doubles event with some quality Pool throughout. 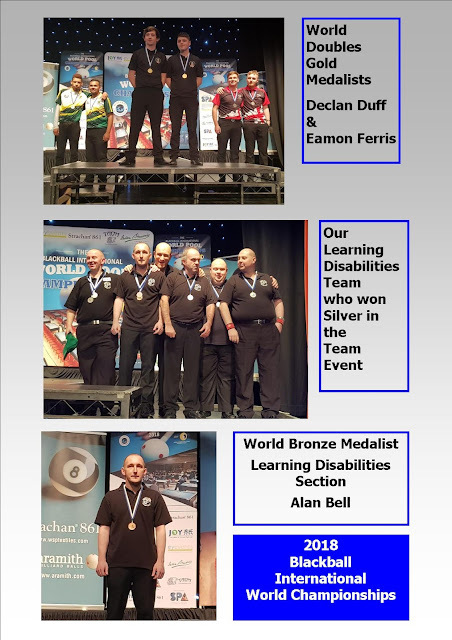 Rab Fee and Declan Lavery won Silver in the Mens Doubles with Gary Clarke and Tommy Morrow taking Bronze, a great showing by our Mens players. We also took Silver in the LD Doubles with the pairing of Clifford Healy and Paddy Reid reaching the Final. Seniors duo Darren Whiteside and Craig Robson just missed out on Bronze medals going down to a South African pairing in the 3rd and 4th Placed Play Off. Apologies if we have missed anyone out still trying to get back down to earth from Planet Pool !! !